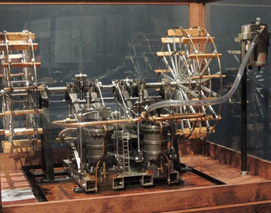 We are pleased to present the Maritime Museum of the Atlantic’s exhibit Cunard 175: Engine for Change. This exhibit commemorates the 175thanniversary (July 10, 2015) of the maiden voyage of Cunard’s flagshipBritannia from Liverpool, England to Halifax, Nova Scotia in 1840. This crossing proved steam power could be practical, reliable and a much faster way to travel the oceans, thus changing travel and trade forever. Cunard 175 tells the story of Nova Scotian Sir Samuel Cunard, his entrepreneurial spirit and keen ability to turn opportunity to success. His efforts culminated in the Cunard Line of steamships that ultimately gave us luxury liners like Lusitania and Queen Mary. Visit the exhibit to learn about Cunard’s early years in a Halifax family business built on privateering and the timber trade, the features of the Halifax waterfront in the 1820s, and how to use technology and business skills to make a fortune in the 1800s. Cunard was a man of his times, and those times included tea from China, shipwrecks and lighthouses, the latest technology and overcoming the limitations of living in a British colony. Discover how Cunard’s connections to Nova Scotia’s early coal mining and his fascination with steam power changed the world. 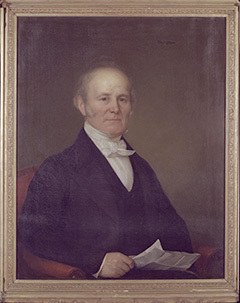 Cunard’s entrepreneurial spirit, technological knowledge, and personal networks were built from the ground up in Nova Scotia, the place of his birth.